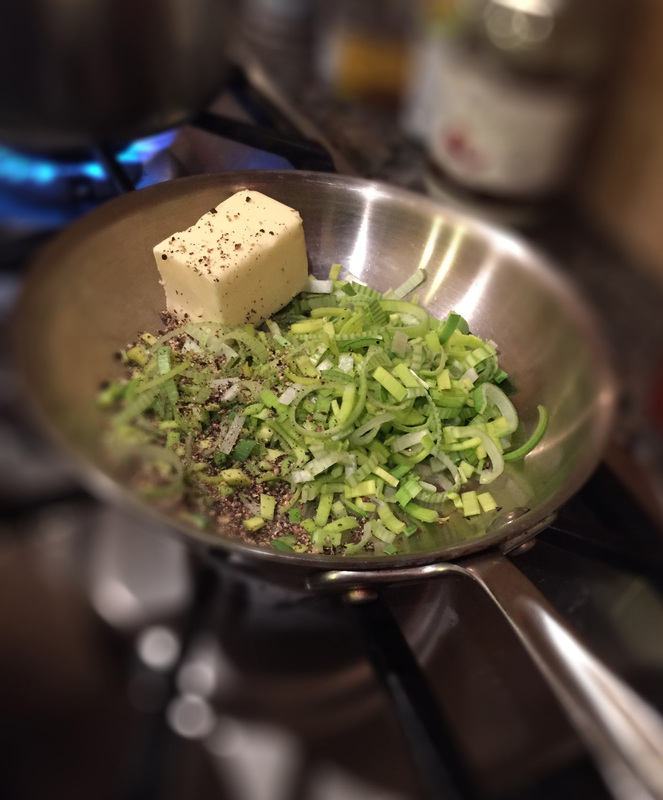 A Keto Friendly brussel sprout hash worth waking up to. I got the wake-up call this morning… “3 minutes to breakfast!” This is always a good thing as my wife is a jedi-master of the breakfast arts. This morning was no exception. Waiting upon my arrival to the kitchen was this most curious and enticing looking dish of Brussel Sprout Hash fully dressed. It was so good I just had to share it with you. A great start for a Sunday morning. Good morning all! And slightly involved but amazingly worth-it endeavor for a weekend breakfast. Slowly saute' sprouts, fennel, peppers, onion, garlic on low - med heat with butter. Turn up heat to brown the bottom of the hash. Add fresh ground salt and pepper. On med heat crisp and brown Proscuitto and pine nuts. Add to chopped cilantro and lemon zest and mix well. I loved this breakfast. The only thing I would like try next time is to add some hollandaise sauce. I’ll keep you posted. Finally, simple pot roast weather is here in the Northeast. Here is a relatively quick and delicious, set it and forget, simple pot roast that will make the house smell great in anticipation for dinner time. You have to plan ahead a little but once it’s in the oven you don’t have to even look at it till it’s done and time to eat – 3 hours later. Think of all you can get done in 3 hours! Served with a side of cauliflower mash and a spinach & sprout salad and you’ll be a hero to everyone at the table. Add the halved onions to the pot, browning them on both sides. Remove the onions to a plate. Throw the carrots and the fennel into the same very hot pot and toss them around a bit until slightly browned, about a minute or so. Reserve the carrots and fennel with the onions. Place the well seasoned meat in the pot and sear it for about a minute on all sides until it is nice and brown all over. Remove the roast to a plate. Put the lid on, then roast for 3 hours. For a 4 to 5-pound roast, plan on 4 hours. Much of the veggies that go into the pot are for flavor. You may have a carrot or 2 with your beef but limit yourself as they are higher carb. Stick with the fennel and some onions. Be sure to add some healthy fat to your side dishes to get the ratios more in line with all the protein in this dish. 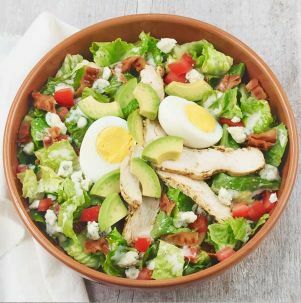 The Best Fast Food Restaurants for a Keto Lifestyle has been a study of mine for some time. I’m busy… I work from home… I’m on the go… I’m running errands… I’m food shopping and I don’t always have time to sit for a longer lunch at the sushi (sashimi for me) bar. Still, I’m not eating just any fast food and the low carb choices out there are few and far between. So I have compiled a short list of quick Keto options that really satisfy even the most refined taste buds on the go. One of my first choices is a new comer to the scene but they seem to be expanding so if you can find one in your area it’s a keeper. BurgerFi is a higher end, pro-environment, fast food burger spot that does things right. No cans in the kitchen – they source from local farms, and they make things fresh daily – a trend that any new breed, fast food restaurant that’s on that ball has shifted to. 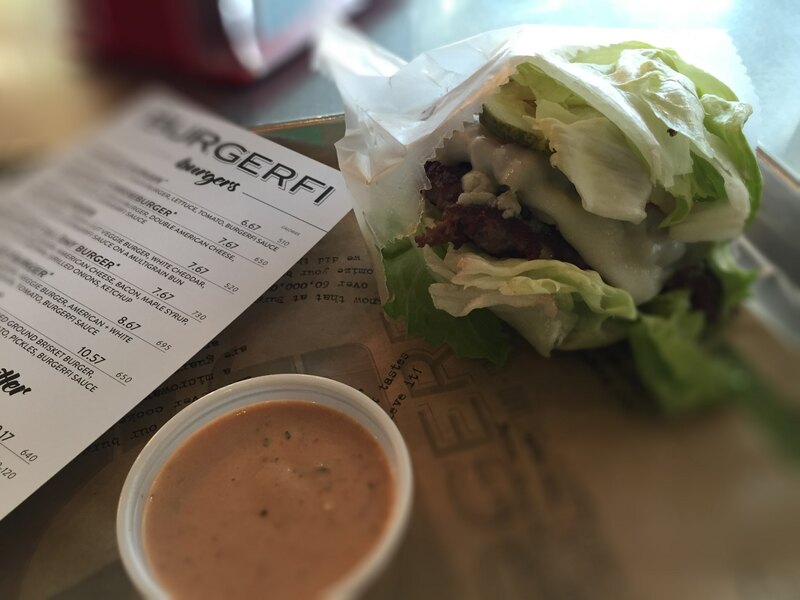 BurgerFi was started in a gourmet kitchen by gourmet chefs. This spot also serves local craft-brews on tap and wine – definitely a few steps up from 5 Guys! I used to go here in my pre-keto days mostly for the chocolate custard milk shake that they make with half-n-half topped with whipped cream – this shake is no joke and is one of the reasons, in my opinion, that the TCBY right next door went out of business after having 2 years of major success. Whenever I would drive by the BurgerFi plaza my car would tend to veer towards this spot. I would scheme with myself on what kind of lighter lunch I could have somewhere to be able justify the 880 calories I would consume if I allowed myself this chocolaty-wasted indulgence. If I actually ate lunch there – complete food debauchery could ensue, as I would get “The Twenty-Eight”, A dry aged double brisket cheese burger with swiss and blue cheese. I thought… “I just won’t get the hand-cut fries” and that would make this 1530 calorie lunch plausible. Nap please! Ahhh… the good ole days when I was fat! But I digress… Now that I am living la-keto-loca I do not physically crave those sugary things and therefore can make better choices. I still get “The Twenty-Eight” at BurgerFi but I get it “Garden Style” so it is wrapped in lettuce bringing the calories down to a respectable 550 and the net carbs to less than 10. The thing I notice most as I leave is that I am full of energy and I feel satiated but not stuffed like I used to. Many decent burger places today offer “Garden Style”. 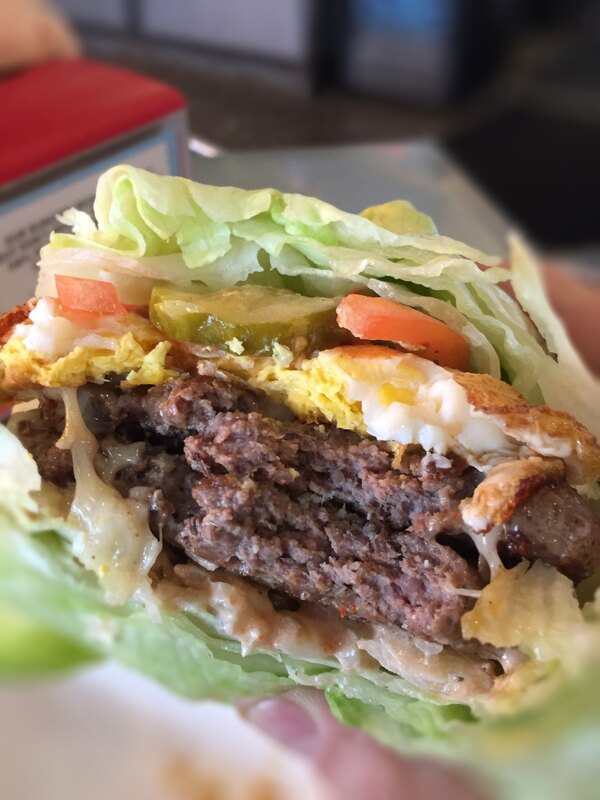 If what is in between the buns was any good to start with – you won’t miss the bun. And the BurgerFi sauce is made in-store daily and has only 2 carbs and most of the calories from fat! So BurgerFi me! It’s good to be Keto! I added a fried egg to this one. Amazing! 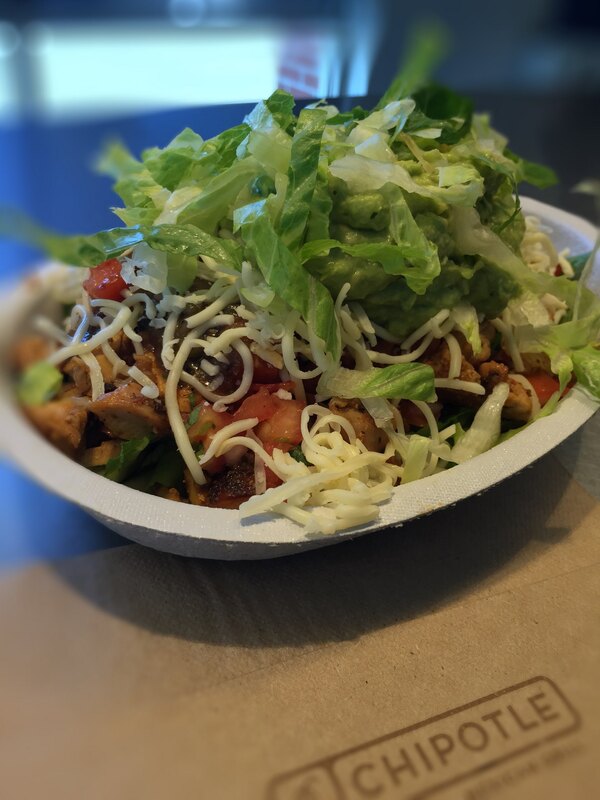 Next up on the list of The Best Fast Food Restaurants for a Keto-Lifestyle is Chipotle. They even have a new calculator on their site so you can zero-in on what you are really eating nutrition wise. I’ll save you some time. There is only 1 thing on the menu that can be considered low-carb and depending on how you order it makes all the difference. Start with a Salad. Add the fajita veggies, your protein – chicken and carnitas are the best choice at 0 carbs. Then add a little of each of the 3 tomato salsas – If you do not want spicy stay away from the green one. Don’t be shy as this will be the dressing for your salad. Add some cheese and if you really want to add some fat and go more keto add the Guacamole which I understand is made in-store, fresh daily and is pretty dam tasty! 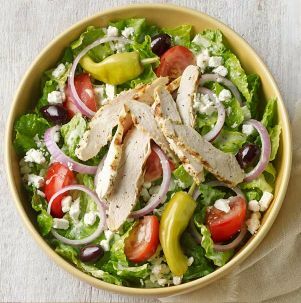 Stay away from the beans, rice, corn salsa and from that vinaigrette dressing as it adds 18 grams of carbs and 270 calories all by itself to your lunch. Last on my list, I don’t recommend if you’re new to keto, as this is not a safe place for you if your carb-craving is not totally under control. It’s Panera Bread! 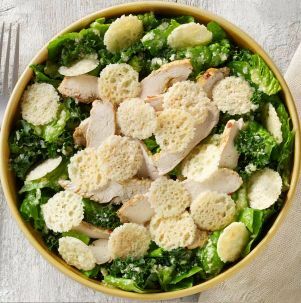 Surprisingly, it appears that Panera is cleaning house and tweaking all of their recipes looking at every ingredient so nothing artificial or questionable remains. Most are still loaded with carbs but I have uncovered a few items worth stopping by for. There are 3 salads on the menu that are great if you’re in hurry. Just be sure to offer the apple or the french bread that comes with, to a friend or non-keto loved one. The Greek is my favorite. Lunch anyone? Don’t bother doing a soup and a salad combo. As yummy as those soups are the lowest carb bowl of soup has 15 net grams of carbs – Low-Fat Vegetarian Garden Vegetable Soup with Pesto. The much-loved Broccoli Cheddar has 20 net grams per bowl. While they were revisiting their soup recipes they should have worked on lowering the carbs… maybe next time.